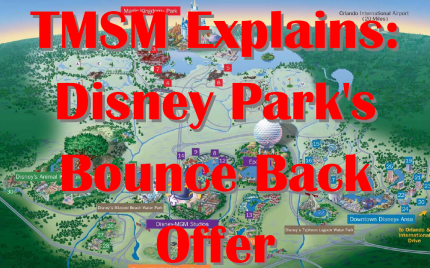 The “Bounce Back Offer” is a deal that many Disneyland and Walt Disney World guests ask about often. “What is the Bounce Back Offer right now?” “Where can I find the Bounce Back Offer right now?” “What IS a Bounce Back Offer?” Today we are going to answer those burning bouncing questions! WHAT the Bounce Back Offer is is simple. For those unsure what a bounce back offer is, it’s a special sale price offered to those who book before they check out of their Disney resort to encourage them to book a return trip early on. This deal is designed to get you to re-book at Disney during set times in the future while you are still at the parks. The offer is a set printed deal, with very detailed rules and terms on it. You must book this deal with a $200 deposit on the phone prior to the end of business day the day you check out. If you usually use a Travel Agent, you will still need to book while there, and transfer the booking to them. Per Disney’s official wording “During select times of the year, Walt Disney World Resort Guests can save on their next Disney Resort stay if they book their reservation before they check-out.” meaning there may be times where a Bounce Back is not offered. Where can you find this offer? Originally at Walt Disney World the Bounce Back Offer was a piece of paper that would be floating around in your room on the table or near the television. The same applied at Disneyland. In the last year or so though at Walt Disney World they have gone from an in room folder that holds all those papers to a “mini magazine” with parks and resort info. Each room now has a min-magazine in it usually on the table/desk or near the television. Inside the mini magazine at Walt Disney World is resort information, park info and parks booklet. Usually in the center of that booklet is the bounce back offer. Call the phone number listed on the flyer while you’re still on vacation. If you wait until you leave the parks and call the day after you get home, the term “to bad so sad” comes into play as it shouldn’t be honored. You will need to commit to a date and make a minimum $200 deposit while on with the special booking number. Can I reschedule after I book my return trip? Disney isn’t very clear on their wording on that, but they tend to let you reschedule the offer as long as you move it to applicable dates. You can cancel within the standard terms of a Disney Vacation. You also can not book this deal for someone else, as it is non transferable. What is the current Bounce Back Deal? Guests can book future Walt Disney World Resort stays while on property, and from time-to-time may receive special savings. Below is a photo of a recent Walt Disney World Resort Bounce Back offer. Does Disney Cruise Line offer a Bounce Back Deal? Disney Cruise Line being it’s own company does not have a Bounce Back. They do though offer special booking deals while you are on the ship which are usually found in your “Personal Navigator” and the awesome cast members at the Future Cruise desk are always happy to help too! Many cruisers do mention offers like 10% off and a shipboard credit, or a lower deposit than usual being required.